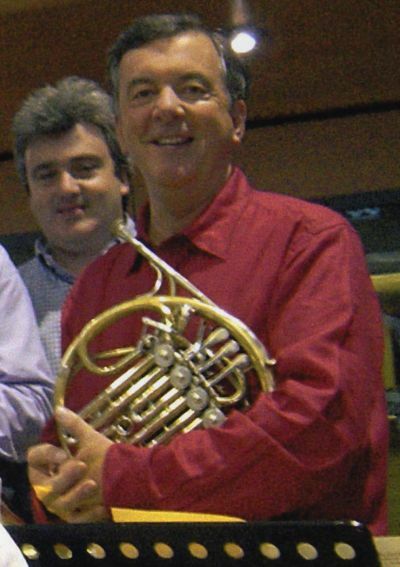 John Pigneguy was born in 1945 at Shoreham-by-Sea in Sussex and while at the Brighton, Hove and Sussex Grammar School (now Brighton, Hove and Sussex Sixth Form College) he had horn-lessons in London with Neill Sanders (Melos Ensemble, Philharmonia and BBC Symphony Orchestras). John then studied at the Royal Academy of Music 1963-66 with James Brown OBE, chairman and principal horn with the Royal Philharmonic Orchestra, winning several prizes. John played frequently with the RPO from 1964 and was also a regular deputy in the original “Oliver!” production at the New Theatre in London’s West End. Also in 1964, he became a founder-member of the Nash Ensemble of London, leaving in 1986. Autumn 1966 saw him playing 3rd horn in the acclaimed Solti Ring Cycle at the Royal Opera House Covent Garden. This was followed immediately by a year of varied extra-work with the London Symphony Orchestra, memorably including the 3-week Rostropovich Cello Festival at the Carnegie Hall in New York (playing 2nd horn to Barry Tuckwell) and a month in Florida at the Daytona Beach International Music Festival which featured, among others, a young Vladimir Ashkenazy and a young Andre Previn. Much freelance work with the other London orchestras coincided with John being appointed 1st horn with the London Mozart Players (1968-70) under the LMP’s founder and conductor Harry Blech, appearing as a soloist on a number of occasions including at the Royal Festival Hall. From 1969 to 1972 he played with the English Opera Group and also with the English Chamber Orchestra and Benjamin Britten at the Aldeburgh Festival, plus recording Britten’s Piano Concerto with Sviatoslav Richter, conducted by the composer. 1972-74 saw John at the Royal Opera House Covent Garden as co-principal horn under the musical directorship of Colin Davis, and playing for artists such as Rudolf Nureyev and Margot Fonteyn, Tito Gobbi, Joan Sutherland, Geraint Evans, Sherrill Milnes and a host of other star performers. Appearances with the Monteverdi Orchestra under John Eliot Gardiner, and the Academy of St. Martin’s-in-the-Fields with Neville Marriner also featured, but it was solo playing and chamber-music (mainly with the Nash Ensemble) which proliferated through these years, with Nash tours world-wide as well as engagements throughout the UK, regular appearances at the BBC Proms and on BBC Radio 3. Many well-received CD recordings of the Ensemble were issued, including the Spohr Octet with its famous horn-writing. John was also invited in 1978 to play the Brahms Horn Trio with Yehudi Menuhin and Clifford Benson at the Gstaad Festival in Switzerland. From 1979-83, he was a member of the Philip Jones Brass Ensemble, touring world-wide and recording extensively with the Ensemble. Throughout the 1980s he was also a regular adjudicator for the BBC Television Young Musician of the Year. He has been a Professor of Horn at the Trinity College of Music, and in 1994 was elected an Associate of the Royal Academy of Music. Studio-recording work for films, TV, pop, “light”music/jazz/ “big band,” jingles etc. was a major feature right throughout John’s career, the first major project being “The Battle of Britain” (1969). This was followed by countless others including various Pink Panthers and James Bonds, Star Wars, Superman, Batman, Gandhi, Cry Freedom, Billy Elliot, Shakespeare In Love, Moulin Rouge, Gladiator, Harry Potter etc. — and for TV including Jewel in the Crown, Brideshead Revisited, Poirot, The Generation Game with Bruce Forsyth, Yes Minister/Yes Prime Minister, The Two Ronnies, Last of the Summer Wine and many others. John also recorded/performed/toured with Frank Sinatra and the Buddy Rich Band, Sammy Davis Jnr and Liza Minnelli, Paul McCartney (see accompanying photo), Eric Clapton, Barbra Streisand, Tony Bennett, a jazz album with Stephane Grappelli and Yehudi Menuhin, Joni Mitchell, Robbie Williams, Madonna, Grace Jones, Bono and U2, Geri Halliwell and many others. In 1984, John decided to concentrate exclusively on the wide variety of work available at that time as a session musician, and was the only London horn-player to do so. His last major project was the James Bond film of September 2002 “Die Another Day” at George Martin’s Air Studios in Hampstead (see accompanying photo), and his final recording-sessions were on Wednesday January 8th 2003, playing for the last two episodes of the BBC TV 2002/3 series of "Last of the Summer Wine” at CTS Wembley Studio 2.